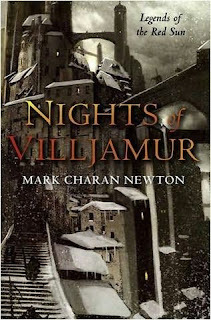 Nights of Villjamur is the second novel by Mark Charan Newton, who has already published some short stories and is also known in the SF community for working for Solaris. The first novel in the planned four-volume Legends of the Red Sun series has already picked up an excellent review from Speculative Horizons. The Jamur Empire sprawls across the Boreal Archipelago and is powerful and rich. However, scientists and cultists (wielders of an ancient, mysterious technology which generate magic-like powers) have warned of the coming of an ice age which will, for a minimum of fifty years, bring death and desolation to the islands. The Emperor has ordered the stockpiling of vast amounts of firewood and firegrain to get through the long winter, but the Empire also faces other threats. The Emperor is paranoid, seeing threats in every corner, but the succession is difficult for his elder daughter and heir Rika is estranged from him. His younger daughter Eir finds herself unable to ease her father's pain, but the arrival of the handsome and dashing Randur to teach her swordplay and dance allows some laughter into her life. However, Randur has his own mission to conduct in the city. Meanwhile, the murder of a prominent city councillor sparks an enquiry from the experienced investigator Jeryd. As Jeryd closes in on the truth, he realises that the Empire is riddled with corruption and he faces danger from his own allies, whilst all the while trying to repair his damaged marriage. Elsewhere, Brynd, the commander of the elite Night Guard, has his own secrets to hide when he is dispatched on a mission of utmost importance to the Empire, but uncovers evidence of even direrer threats emerging as the ice sheets advance southwards. Nights of Villjamur is a multi-stranded novel with several different POV characters and a multitude of storylines, some of which are linked and others which (so far) appear unrelated. The story of an empire under threat from within and without is not unusual in the genre, but what is (relatively) unusual is that the author brings an interesting prose style and a more measured pace to bear on the book. The storyline unfolds deliberately, carefully, and the book's rich writing draws you into its world, the story and the lives of the characters in an accomplished manner. It's not a frenetically-paced, page-turner of the book (at least not until the last fifty pages, when events kick up a gear), but instead a work that immerses you in its world and demands you pay attention. The city of Villjamur and its surrounding islands are vividly described and the characters are fascinating. The form of magic (relying on ancient technology only dimly understood by those who wield it) is also quite intriguing, and the snowy, cold landscape is well-drawn. There are a few problems, however. The political landscape of Villjamur is not described in as much depth as it could have been, and the ongoing struggle between the Emperor and the Chancellor is described only in fits and starts due to our main POV in that area, Eir, having other concerns. Aside from that, this is a polished and accomplished debut novel and is well-recommended. Nights of Villjamur (****½) will be published in the UK on 12 June 2009 by Tor UK. US import copies should be available around the same time. The author has a website at this location. Book is on my list! Also much looking forward to this. 2009 so far has been rather dismal with the "meat" finally starting to show up in the next quarter. Interesting to see your opinions largely matched mine, Adam.